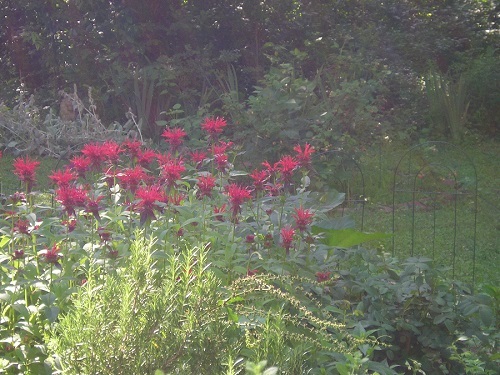 I wait with anticipation for the appearance in Spring of my beautiful bed of Monarda Didyma, or Oswego Tea. Before the blooms, I can enjoy the fragrant and delicious foliage. 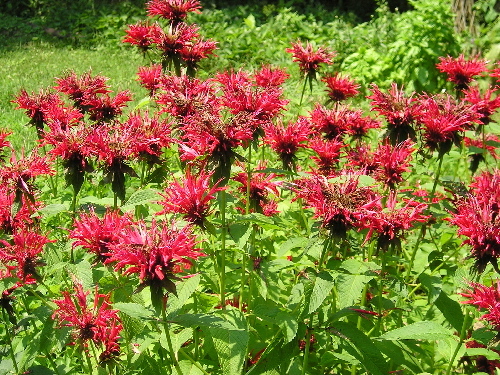 Also known as Scarlet Bee Balm, it is an ancient American native plant. The genus is named after Nicholas Monardes, a Spanish physician who wrote in the 16th Century about New World medicinal plants. The common name was bestowed by John Bartram (1699-1777), a Quaker farmer known as the “Father of American Botany”, who observed Oswego Indians using it for tea. It was used as a substitute for black tea during the American Revolution. Monarda Didyma is less medicinal in taste that its cousin Monarda Citriodora (Lemon Mint). Like all members of the mint family it has a square-shaped stem. The large shaggy brilliant red flowers grow 30-36″ high and are aromatic and edible. Unlike other Bee Balms, it does not invite mildew — that unattractive “frosting” on the foliage so common on Purple Bee Balm in particular — in the garden. It is delightful and impressive to scatter the red petals over any entree or salad. An important bee forage plant it is also very attractive to hummingbirds. Here in North Carolina it fills out beautifully from early Spring and then blooms for weeks May-June and, if you deadhead the blooms, you will enjoy another burst of color again in August. Also a nice cut flower, wonderful tea and potpourri when dried. Native Americans used this plant to cure flatulence and insomnia. The Blackfeet used poultices of this plant for skin infections and minor wounds. It is also used for mouth and throat infections since it is a natural source of the antiseptic Thymol, used in modern mouthwashes. The seeds are somewhat difficult to harvest as they appeal to many birds. You can either bend the stem over a bowl gently, so you do not snap it and tap the base of the flower. If the light brown seeds fall out you are in luck! If you miss them, there’s always next year, as this wonderful flower WILL be back! An alternate method, and one which may yield a second bloom, is to cut the spent flower heads back to a leaf union and carefully place the head on paper for drying. If you do this properly, your plants will sprout new stems with flowers at the union, and once your harvested flower heads are dried, you can gently crush and shake them over a white paper plate until the seeds are ejected. Now — this is important — you will see many many more little black square irregular grains that look a bit like pepper. These are NOT seeds. But there are lots of them and you need to carefully search for the few seeds which are roundish, smooth and light brown. Finally, a note about harvesting for tea or medicinal use. When gathering herbs for fresh use, pick early in the morning, when still kissed by dew. But when gathering herbs for drying, wait until the sun has dried the dew, to prevent mildew. Gather small bunches of the healthiest plants and tie at the ends with string with a tail. Then hang in a protected environment. For me, it is from the shutters of my interior kitchen window over my sink. No sunlight at this window but plenty of fresh air as an overhead fan circulates during warmer months. This is ideal. Otherwise, special drying racks work well. The idea is to dry quickly, without sunlight, but plenty of air circulation to keep mildew from forming. Turn if necessary to make sure the bunch dries completely. Once dry, crumple the leaves from the stems and store in airtight canisters. CherryGal.com is offering this wonderful and special herb in two organically-grown forms, both in LIMITED SUPPLY — as Seed and as lifted Seedlings in Spring. Don’t wait until they are all gone! Get your seeds now, or reserve your seedlings for shipment at the appropriate time for your growing zone.